While a Bushnell patron may think that he/she has purchased a ticket to the comedy “The Play That Goes Wrong” by Henry Lewis, Jonathan Sayr and Henry Shields that is only partly correct. The primary story is the play-within-a-play, “The Murder at Haversham Manor.” The Cornley University Drama Society has transported itself from the British Isles and landed in Hartford for one week. The troupe, called Mischief Theatre, sticks to its name with naughtiness even prior to the play’s start, continuing for the next two hours. For those theatregoers who might have a Top 10 list of plays which include “Noises Off” by Michael Frayn, then this production is an ideal choice. If other comedies include “The Real Thing” (Tom Stoppard) or “Play On” (Rick Abbot), “The Play That Goes Wrong” will be a treat. The theme, format, and characters are, for the most part, similar. Throw in the slapstick of “Shear Madness” (Paul Portner) and the wit of many David Ives’ works, and again, you have “…Wrong”. Most of those making up the opening night full house at the Bushnell were thrilled to see the similarities and laughed, almost incessantly. 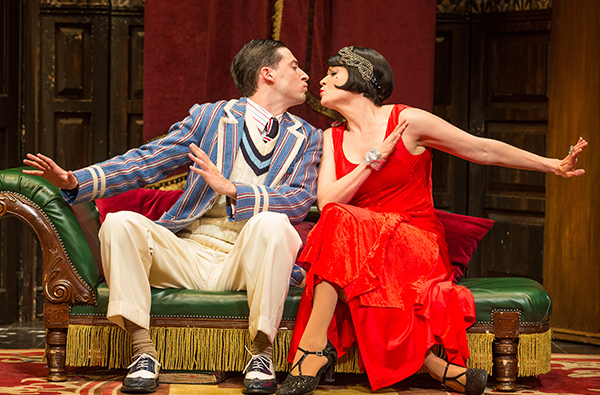 “The Play That Goes Wrong” is The Bushnell’s challenge to mount a non-musical production to initiate it’s 2018/19 season. By the laughter and obvious fun, it certainly seemed like a success. There’s more to enjoy after the return home from the theatre – reading the program book. Actor bios are quite inventive, and in keeping with the evening’s entertainment. The cover of the playbill for “Make Believe” depicts a cartoon of four children, all in color, with little tags on their clothes and bodies. For those who remember the 50’s and 60’s, these kids look like those from McCall’s Magazine’s then-famous Betsy McCall toy paper dolls. For other audience members, the picture will imply a game of “make believe.” More importantly, the pictures of a mom and dad are hollow and grey, standing apart from each other. From the play’s start, it is obvious that there is something amiss in this imaginary family. 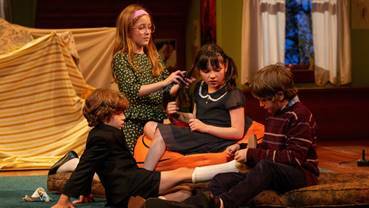 Although a one-act, the play is divided into two parts: the first features the quartet of children, the second with four adults three of whom are grown-up versions of their counterparts. “Growing pains” might be a very simplified subtitle of this story, which dwells on the subject of sibling relationships at two different stages in their lives – both without parental figures. Roman Malenda (older brother), Sloane Wolfe (older sister), Alexa Skye Swinton (younger sister), and RJ Vercellone (younger brother) fill the individual personalities of their roles perfectly. Each is so real in his/her part. Hartford Stage’s casting crew could not have found more talented youngsters better than these four. Chris, the oldest and leader of the clan, enjoys “let’s play house.” As the youngsters replicate their household drama, the audience can see the touching and sad situation that their invisible parents have put them in. Director Jackson Gay creates Bess Wohl’s work as a play within a play; i.e. the child characters enjoy their world of “make believe,” then the adult actors realize the not-so-pretty mysteries of “make believe.” The large playroom setting establishes the ideal segue from Part I (kids) to Part II (adults). Important to realize that in spite of advertisements for “Make Believe” with the depiction of cute kids, this is not a show for audience members under age 18, as clearly stated in the venue’s literature. Bravo to Hartford Stage for taking yet another risk presenting a world premiere. Note: While this recommendation does not in any way reflect on Hartford Stage and/or “Make Believe,” it is important. Future patrons of any performance, in any venue, please do not drench yourself in perfume before entering the theatre. Sitting for a one-act play next to one of these culprits was nearly unbearable. Consider your neighbors. Taylor Mac is one of the most interesting playwrights working in theatre today. A finalist for a Pulitzer Prize in Drama, Mac has accumulated many awards in literature. In “Hir” Mac pushes the boundaries of absurdist theatre. 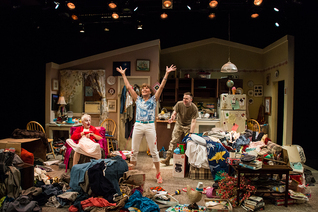 A big mess is exactly what the audience sees when they enter the theatre. Clothing is strewn everywhere and this small “starter home that never really got started” is indicative of a family that never moved forward, but certainly devolved backward. Metaphors of past and future are embedded in the dialog, but the real message is that this is a show about the messy present we inhabit. An excellent cast delivers performances that are nuanced, energetic, and loaded with cultural meaning. Elizabeth Aspenlieder as Paige, the mother, wants to be the guiding light of her family and thrills with the realization of a “paradigm shift.” Arnold, the father, subtly and sublimely played by John Hadden, has had a stroke, and Paige emasculates him by forcing him to wear women’s clothing and make-up—her revenge for a lifetime of abuse. Max, portrayed by Jack Doyle, is transitioning from Maxine to become a “trans masculine” hir. As Isaac, the elder son, Adam Huff is dynamic as a drug-abusing marine charged with picking up the body parts of the deceased. Now, he’s home, trying to put the pieces of his family together again. “Hir” deals with toxic masculinity and the changing culture in which we live. It is messy, and sometimes painful to watch, but what makes it so jarring is that it most certainly contrasts love and abuse. “Hir” contains strong language and themes may offend some people, but it is an important play in that it is in the crosshairs of contemporary culture and confusion. 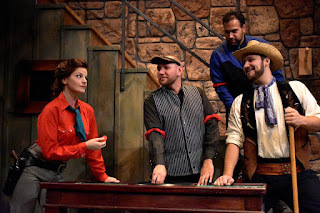 “Johnny Guitar, the Musical” (“JG”) is a chick western; meaning that it’s not just for female audiences but is a western whose lead roles are female. A bit atypical, and a bit fun. While “JG” hit the Off-Broadway stage in 2004, it was 50 years prior when the movie version of the same name opened, starring Joan Crawford. The plot of “JG” is slim; i.e. good guys versus bad guys, more or less. However, remember that the guys are gals, which creates an edge and adds humor to the comings and goings of the main characters. Myka Plunkett portrays our pistol-packin’ heroine Vienna. Bethany Fitzgerald depicts her arch nemesis Emma. Plunkett wears a tough exterior. She’s no Crawford. Plunkett is a beautiful young woman, perhaps a little too good-looking for the role. 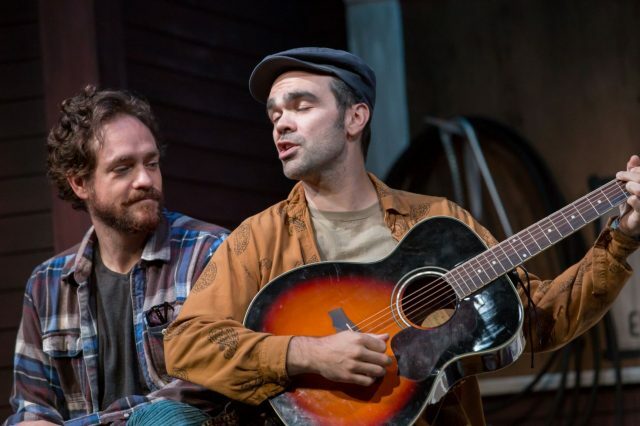 Plunkett’s songs offer the audience a mid-West twang mixed with smooth soprano notes. Fitzgerald spends more of her stage time as a somewhat buffoon-like comedian. Billy Clark Taylor’s (Vienna’s love interest Johnny) exquisite talent is his voice, singing most of the ballads. The production belongs to Mitch Chakour and his band. Chakour’s name is synonymous with The Majestic. It is his skill and that of his team that delivers most of the success to “JG.” That said, many of the solos, duets, and ensemble pieces are a pleasure to hear, yet at times, the band drowns the singers’ lyrics, and/or the singers do not project. This can be a small and fixable problem in future performances. Given the title of the show, it’s no surprise that a guitar features prominently. Credits list Chakour and Aaron Porchelli as guitarists. A running theme couples a background guitar refrain each time any actor says the name “Johnny Guitar”. It is this type of campiness that works well. Unfortunately, there are many missed opportunities for similar schtick. 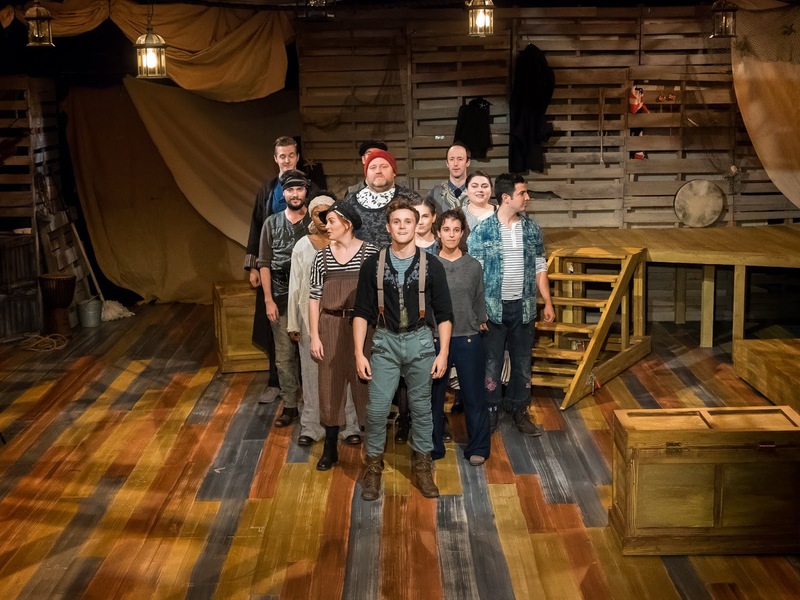 No review of any Majestic production can omit praise for Greg Trochlil, scenic designer. It’s difficult to imagine that a movie set and lots of money to build it can look more authentic than Trochlil’s saloon. A word about the program book: What a pleasure it is to read bios about everyone (not just actors): musicians, designers, and techies. However, where is the song list? Audiences want that information. In his curtain speech before the show, CT’s Producing Artistic Director Daniel Elihu Kramer (also the production’s Director) suggests that the audience may need to keep an open mind during the performance of this thought-provoking play. “The Aliens” is a story about remarkable people who don’t necessarily fit into “normal” parameters, and what befalls those who ask only that the world allow them to fit in as they choose. The three actors in this fine production handle their roles sensitively and naturally; it is lovely to see performers skilled enough to express character through silence as well as dialogue. Each one creates a unique persona in their roles, and a camaraderie that bridges the differences between them. As writer Jasper, James Barry reveals a rough and roguish outside and poetry within. His reading of an original piece about his own life wanderings, as well as excerpts from the writings of Charles Bukowski, are inspired. Barry brings a wonderful Mad Hatter charm to his role, and palpable strength and devotion to his relationship with the more vulnerable KJ. Irresistible charm, extraordinary gifts, and human frailty and complexity shine in the performance of Joel Ripka as KJ. This actor portrays a somewhat tragic figure with grace and often glee, especially when he sings. He never crosses the line which might make the character feeble; instead, his performance gives life and light to KJ, and credence to the affection which the others so clearly hold for him. Some of the finest moments occur in Paul Pontrelli’s portrayal of Evan, a young man closer to the customary definition of normal, who is drawn into an unlikely friendship with the others. Pontrelli’s comic timing, combined with his ability to share raw emotion, tis a joy to behold. Winning and authentic, he is a perfect foil for the unusual duo he befriends. Simple and effective costumes by Stella Schwartz reflect the characters beautifully, subtle lighting designed by Lara Dubin, stunning sets by designer Ed Check, on-point sound by Tom Shread and some wonderful original music by Michael Chernus, Patch Derragh and Erin Gann all add to the power and sweetness of this story. 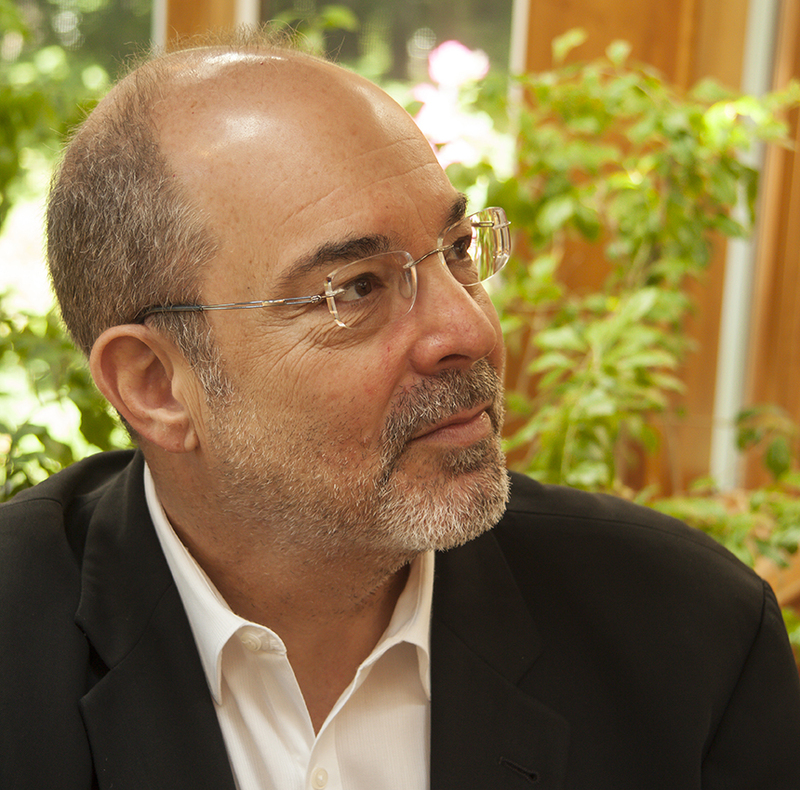 Director Kramer allows the tale to unfold in quiet ways, giving the audience much more than an unusual theatre experience that can open minds; “The Aliens” is about opening hearts as well. With all its fine production elements, excellent performances and moving story line, this show does just that. Note: “The Aliens” ended the outstanding Chester Theatre’s summer season. Due to unforeseen circumstances, this review could not be posted in a timely manner. However, it is important to inform our readers about regional productions, no matter what the date.